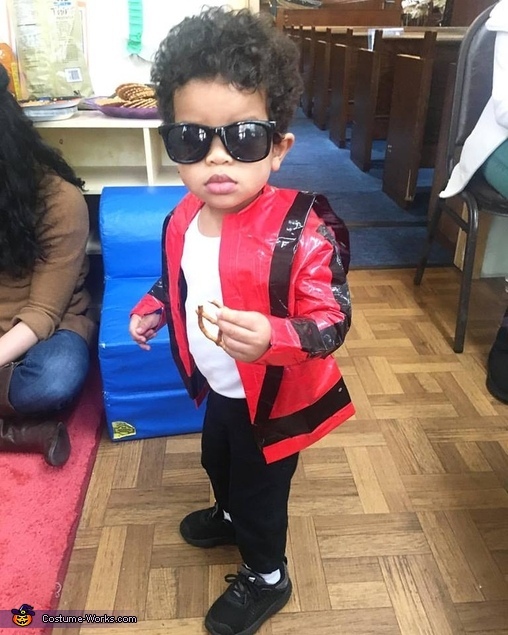 My 1 1/2 year old son Amir is dressed as Michael Jackson. I didn't want to shell out the big bucks to pay for a red pleather jacket so I made one out of 1 long sleeve and T-Shirt, and red and black duct tape. We had to loosen up the tape when we first put it on but it actually looks like an expensive jacket! I pair with a white onesie, is old black pants (so that it'll flood), white socks, black shoes, and of course black sunglasses that he kept on the entire time.